Lorena Escolero lets fly the decisive Fenway triple - note the score and the time left in the background. 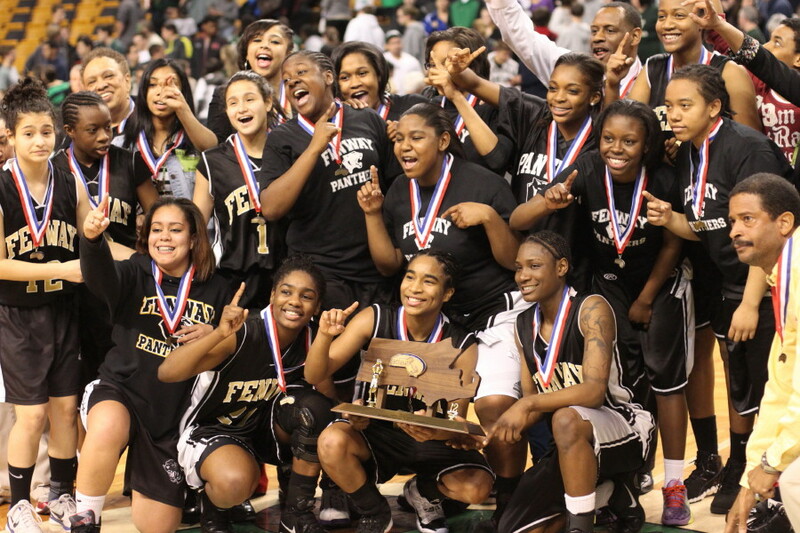 (Boston) Fenway (19-3) defeated Greater New Bedford, 58-49, to become the 2012 Division Four champions on Tuesday afternoon at the TD Bank Garden. And if there ever was a misleading final score, this one would be it. We saw a game with ten ties and thirteen lead changes. You bet it was close……….until the final 1:52 when Fenway, trailing 49-48, scored all ten points the rest of the way to get to 58 while GNB stayed at 49. It was a startling ending to such a tight contest. 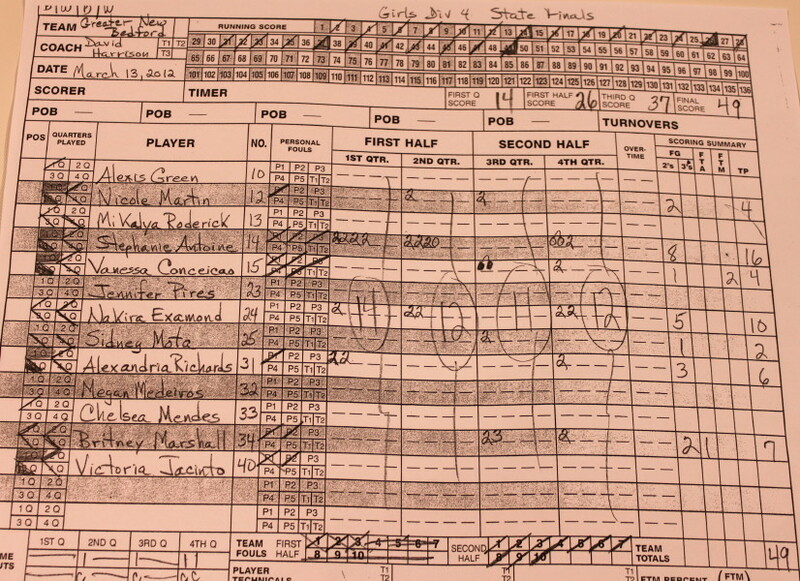 The biggest shot of the game may well have been the triple that freshman Lorena Escolero put in with 1 ½ minutes left to start the Panther 10-point surge to the title. I never saw Lorena shoot another shot before or after and she may well have been in the game only because 6-2 Jalissa Ross (11 points) had fouled out with 3:51 left. Whatever the case, Lorena’s long one turned the tide for Fenway. The Lady Bears led 45-40 (3:51 left) when Jalissa went out and I thought at the time that GNB would dominate inside the rest of the way. 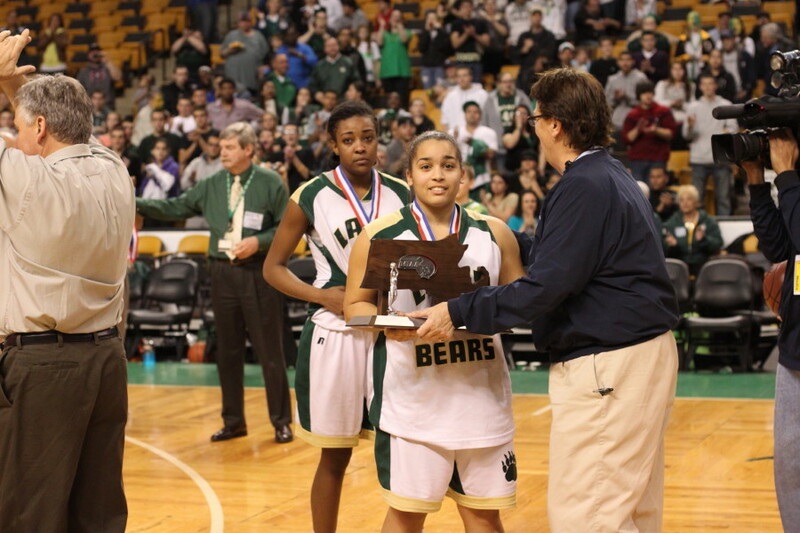 It just didn’t happen although Nakira Examond’s layup on an inbounds play did give the Lady Bears their final (49-48) lead. 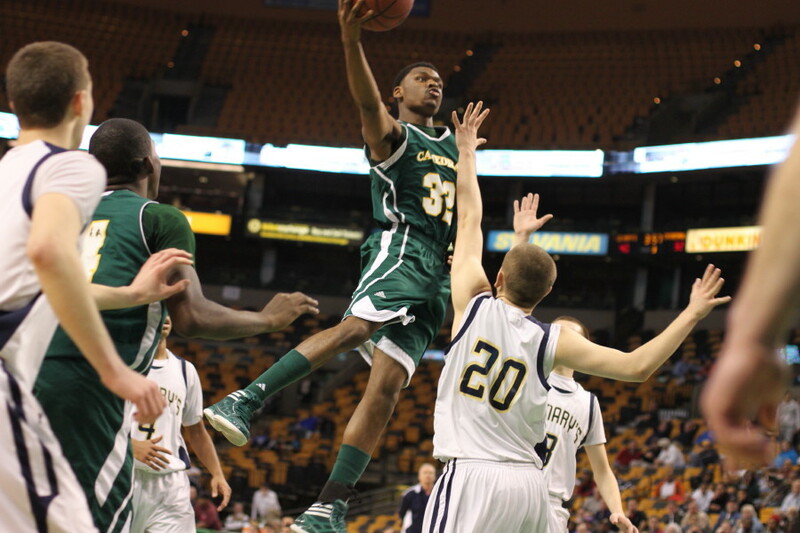 Sophomore Cadejia Matthews (12 points) had a huge final quarter with ten points. 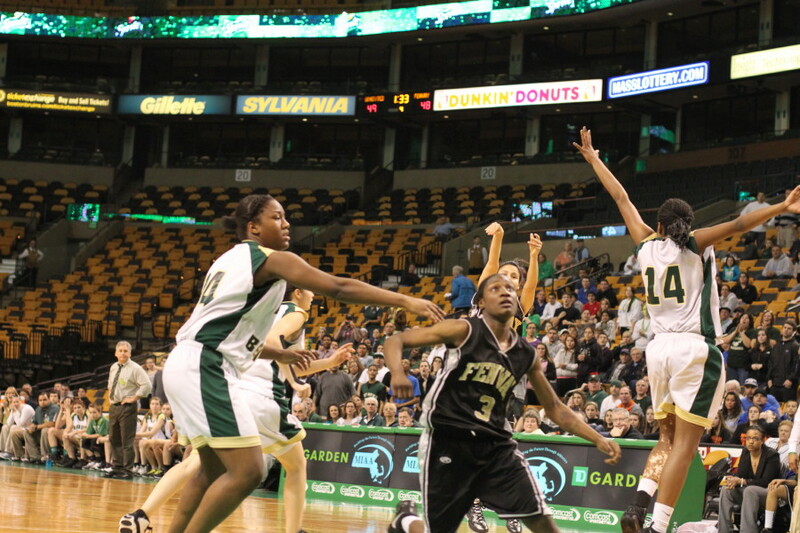 She put up eight straight for Fenway with an old-fashioned three, a three, and a jump shot to keep the Panthers close. 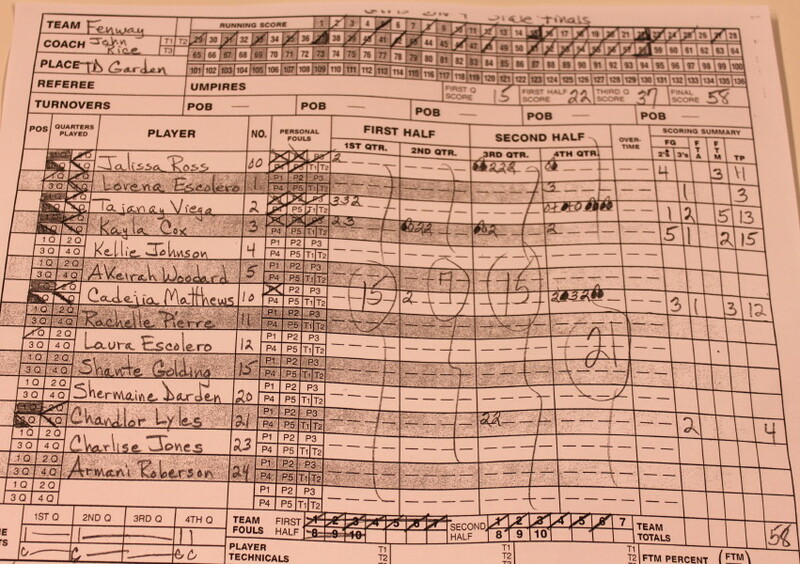 Then after Lorena hit her big triple, Cadejia made two free throws. 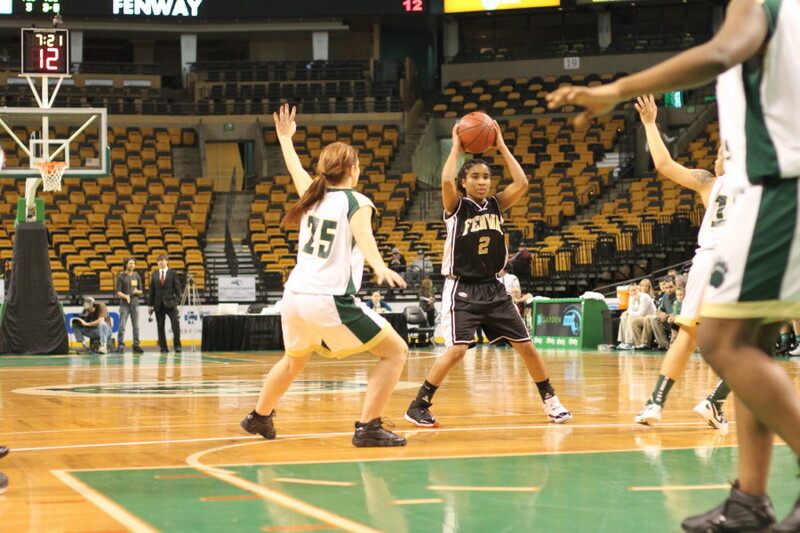 Also big in the closing minute was junior Tajanay Viega (13 points). 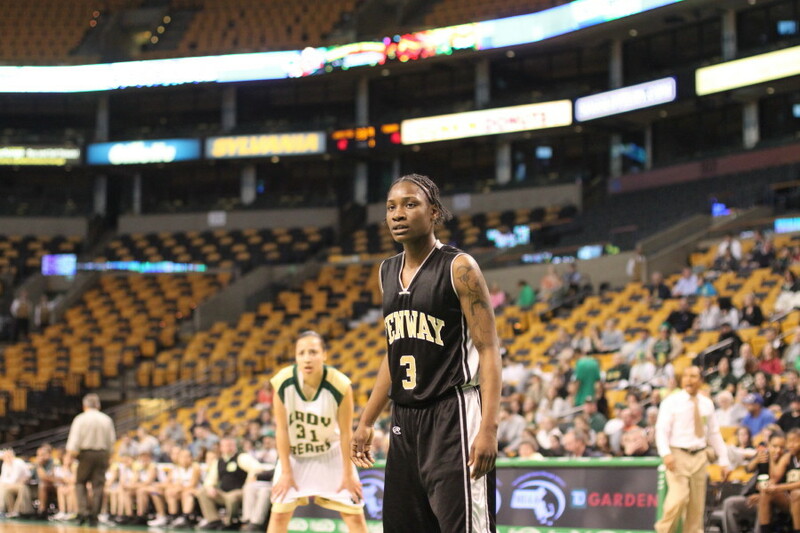 Tajanay dropped five free throws in the final thirty-five seconds to thwart any GNB hopes of a comeback. 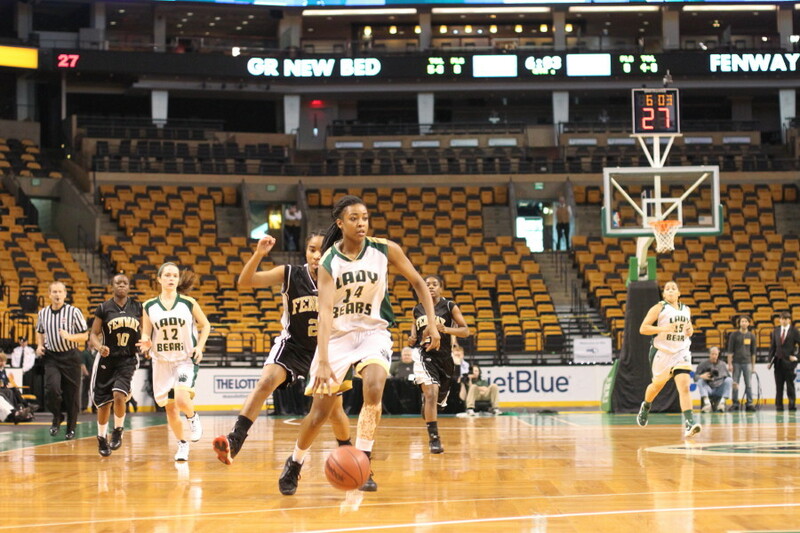 Fenway’s harassing defense had a team, with dangerous scoring options, out of kilter most of the game. The Panthers forced twenty-nine turnovers by my unofficial count. A number of those turnovers became layups. 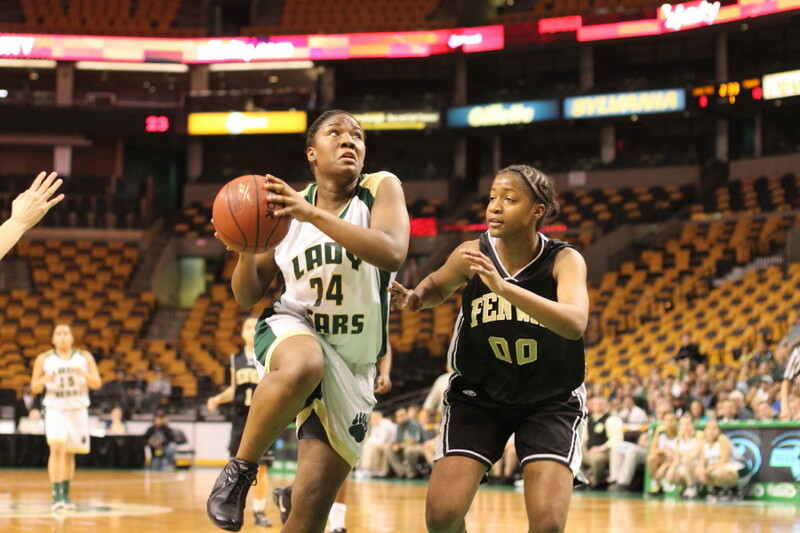 The Lady Bears were down by six (20-14) 2 ½ minutes into the second period before they shut down Fenway for four minutes and rolled up ten straight. Stephanie Antoine (16 points) had six in this run (two converted rebounds and a layup) and the other four points were on a converted rebound (Nakira Examond -10 points), and a Nicole Martin jump shot. GNB led, 24-22, at the half. An important second half stat was that Stephanie Antoine (she averages 24.8 PPG) had only two points in the second half. 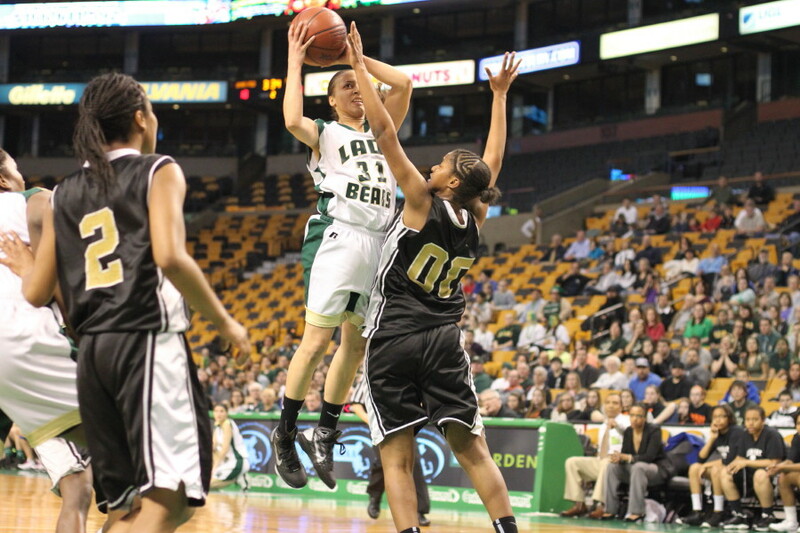 Getting the ball to her in a scoring position was very difficult for GNB with all of the Fenway pressure. 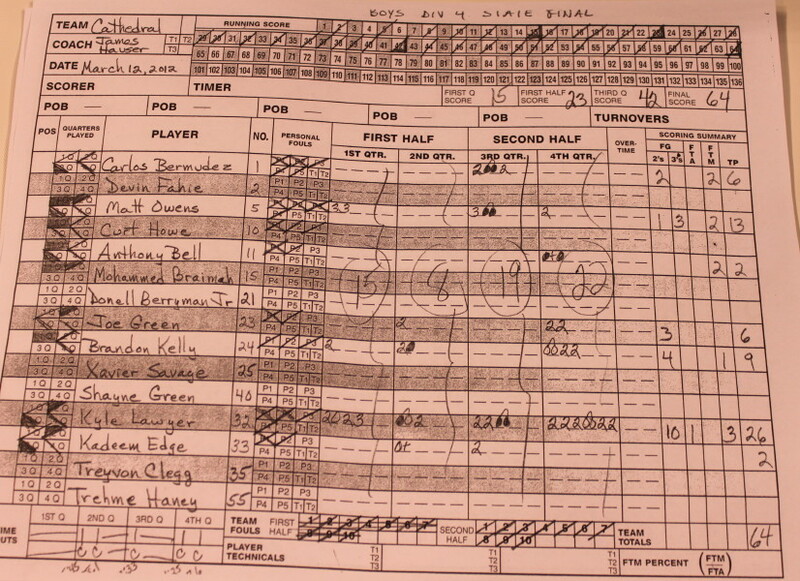 The score was tied, 37-37, after three periods. Final quarter? Eight lead changes with the last one (51-49) coming on the Lorena Escolero triple with 1:25 left. 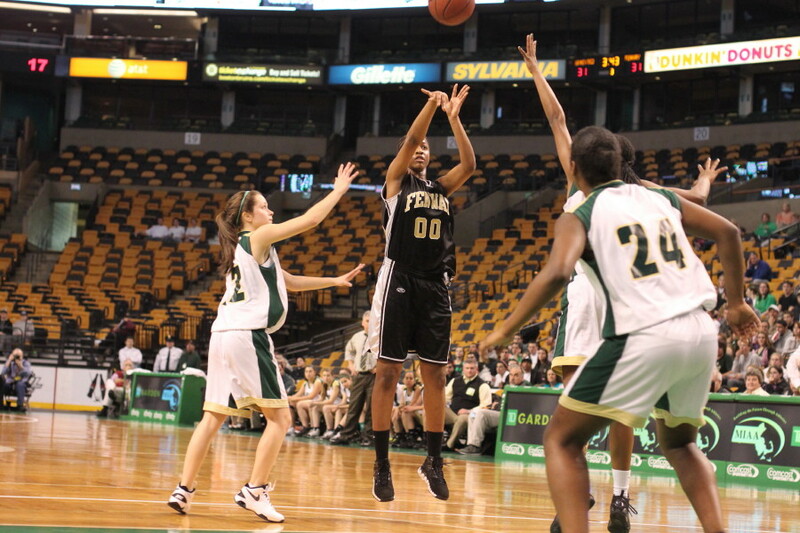 Vanessa Conceicao had the unenviable task of trying to bring the ball into the frontcourt against the Fenway double teams. Sometimes it worked and sometimes it didn’t. Senior Kayla Cox led the Fenway point getters with fifteen. She put in points in every quarter and had more rebounds than someone 5-4 should get. Her quickness and ball sense made the difference. Greater New Bedford (21-4) has won three straight vocational titles. Fenway was 15-0 in the Boston City League (North). They won eighteen of their last nineteen games. 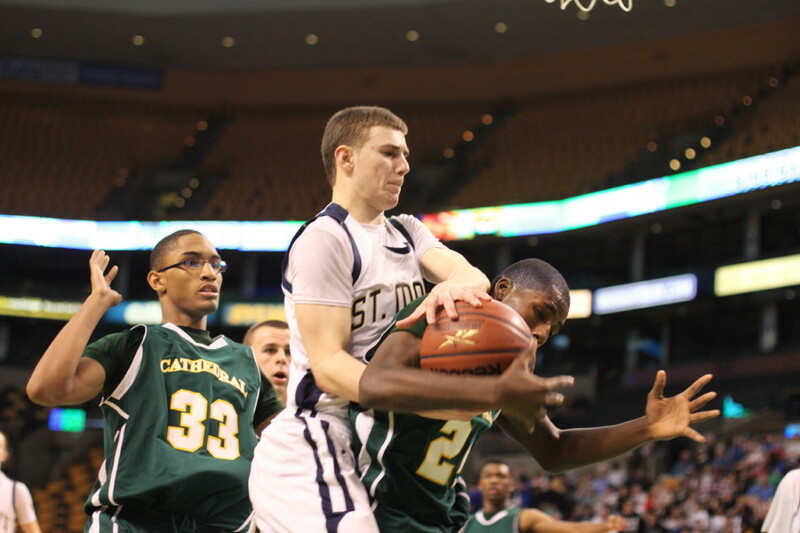 (Boston) The St. Mary’s Spartans are the 2012 Massachusetts Division 4 champs after defeating Cathedral, 70-64, on Monday afternoon at the TD Garden. 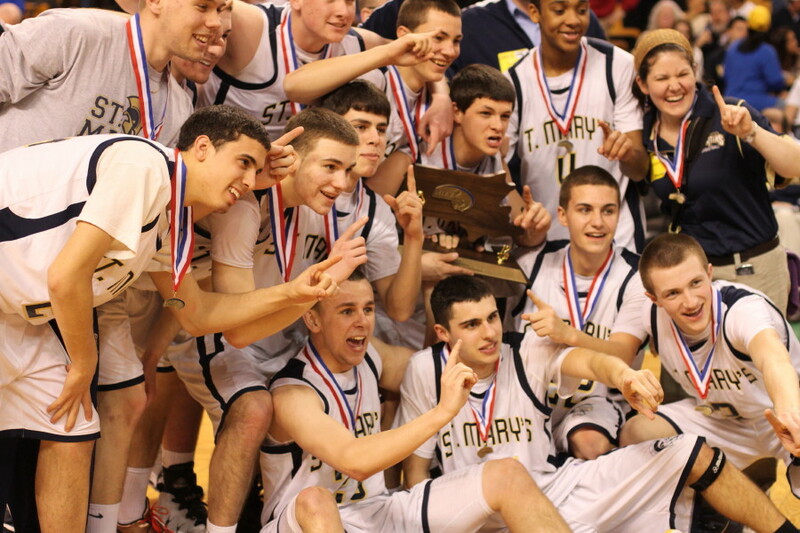 St. Mary’s won despite missing seventeen free throws and squandering most of a 60-46 lead in the final quarter. Cathedral had their fan base rocking as they got within four (62-58) on a couple of Kyle Lawler (26 points) lane scores with 2:15 left. But the Panthers came up empty on their next four possessions while the Spartans tallied five points on one Nick Gagliolo (19 points) free throw, two freebies by Randolf Thurman (14 points) , and a breakaway layup by Devin Thompson (25 points). 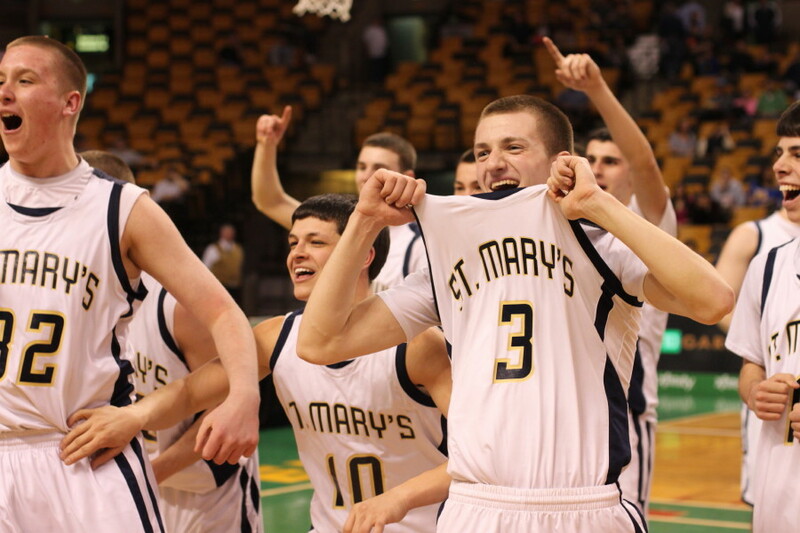 Those five consecutive points put St. Mary’s up by nine (67-58) with forty seconds left and clinched the title for the team from Lynn. Both teams are out of the Catholic Central Conference (Large) and were very familiar with each other. They had met twice and split the results so this game figured to be close. 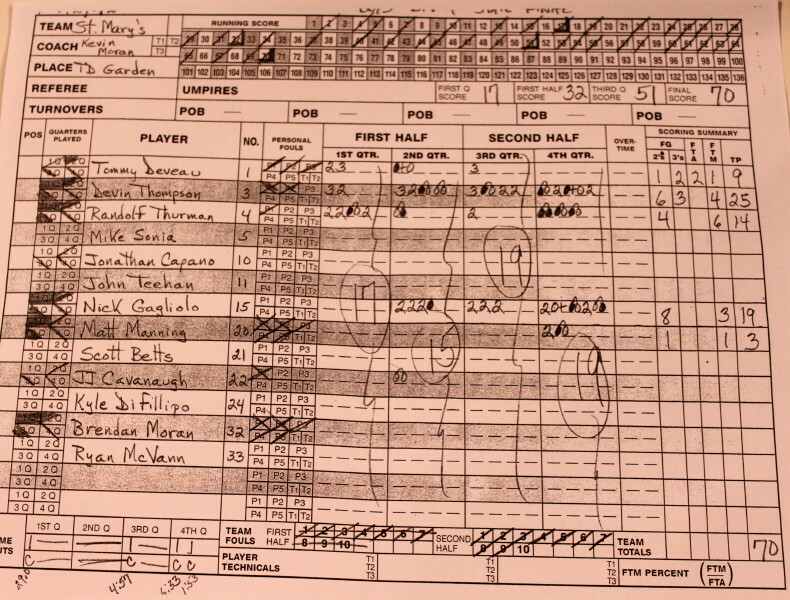 St. Mary’s (20-4) broke away from a 15-13 deficit with two minutes left in the first quarter stringing together nine straight points to take the lead for good (22-15) 1 ½ minutes into the second quarter. A jumper by Devin Thompson, layups from Randolf Thurman and Nick Gagliolo, and a Devin triple did the damage for the Spartans. 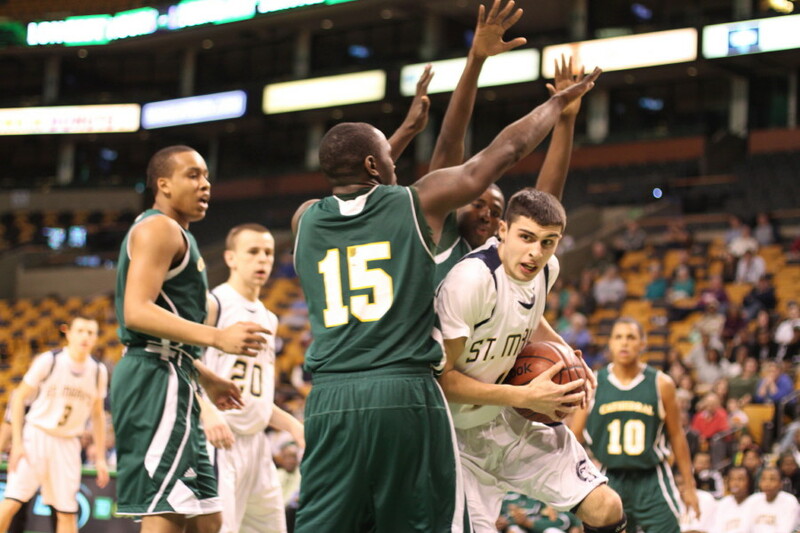 Cathedral battled back to 26-23 but the Spartans ended the quarter with six straight points with five of them from Nick Gagliolo. 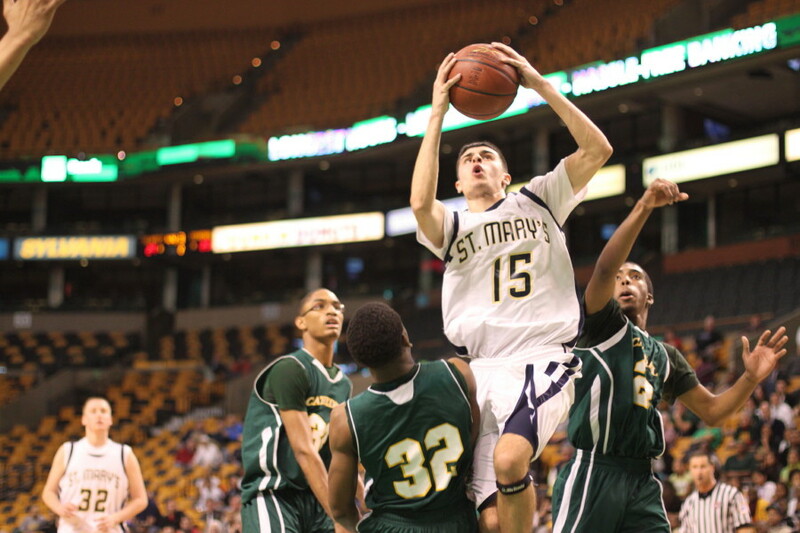 St. Mary’s led 32-23 at the half. 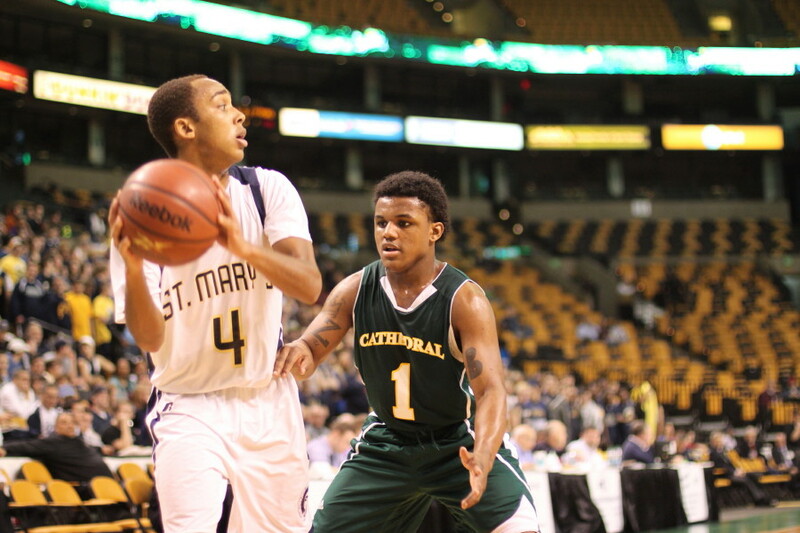 That nine-point lead was still there for St. Mary’s after three quarters (51-42) and you wondered if Cathedral (17-7) could make things interesting the rest of the way. It sure didn’t seem like it when Devin Thompson sailed in on a fast-break layup to give the Spartans a 60-46 spread with 4:52 left in that final quarter. 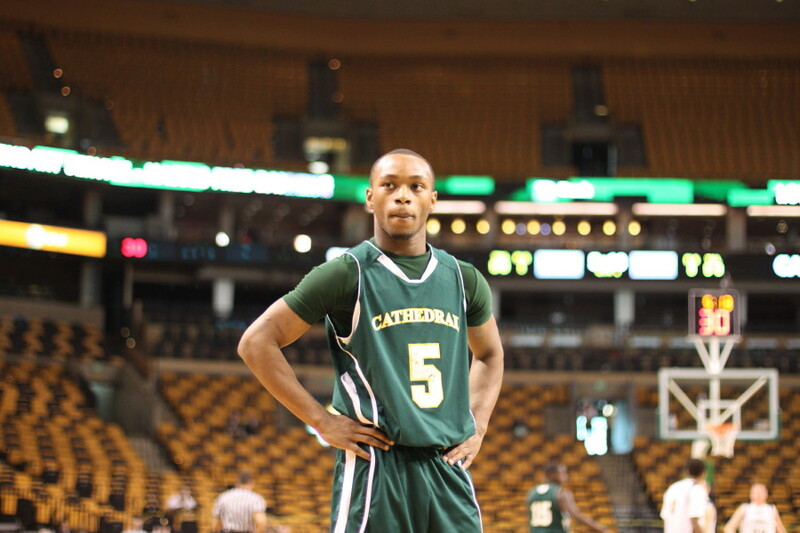 But suddenly over a one minute span Cathedral put together eight in a row (two converted rebounds by Brandon Kelly, a layup after a steal by Kyle Lawyer, and two Anthony Bell free throws) and they only trailed 60-54 with 3:45 left. There was certainly plenty of time for the Panthers to complete the comeback. The Spartans hit just two of four free throws and unstoppable Kyle Lawyer got into the lane twice for scores. Within four (62-58) with 2:15 left the sense was that they would get closer…… but they didn’t as the Panthers came up pointless over their next four possessions (one was a turnover and another was two missed free throws). Seniors Kyle Lawler and Nick Gagliolo were 1000 point scorers during their careers. The Spartan free throw shooting was frightening. Hitting only 15-of-32, they kept Cathedral in the game. Missing eight in the last quarter, nearly let the Panthers sneak back into this one. 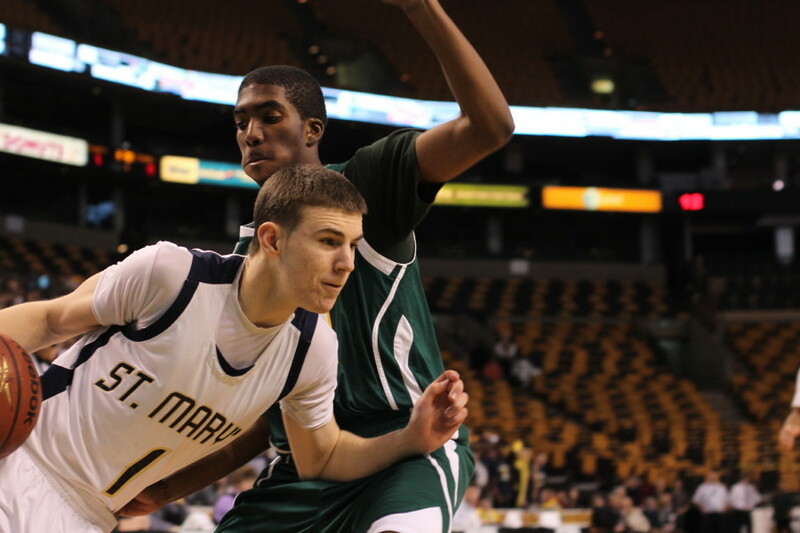 Matt Owens (13 points) was Cathedral’s second highest scorer. He had three triples. He also had several long-range airballs. (I’m convinced that unless players play in field houses during the season the depth perception at the Garden can throw some of them off.) Matt seemed to be an example of that. 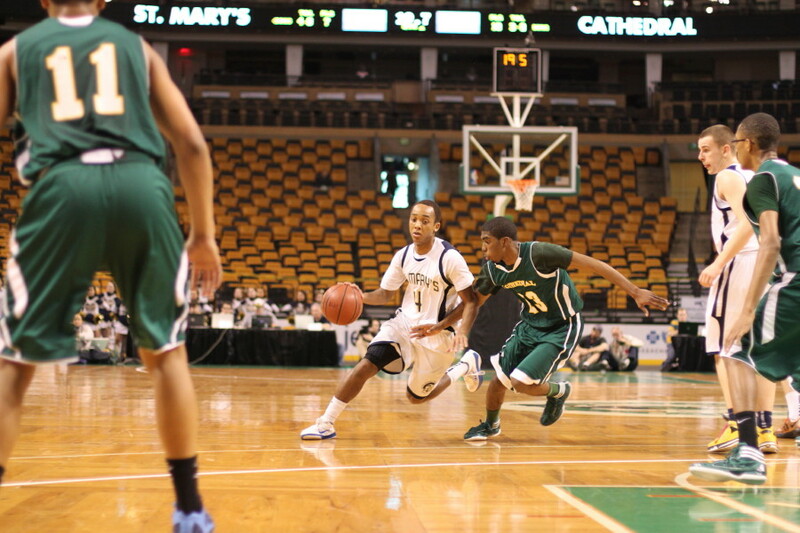 I came away impressed with the ball-handling skills of St. Mary’s point guard, Randolf Thurman. 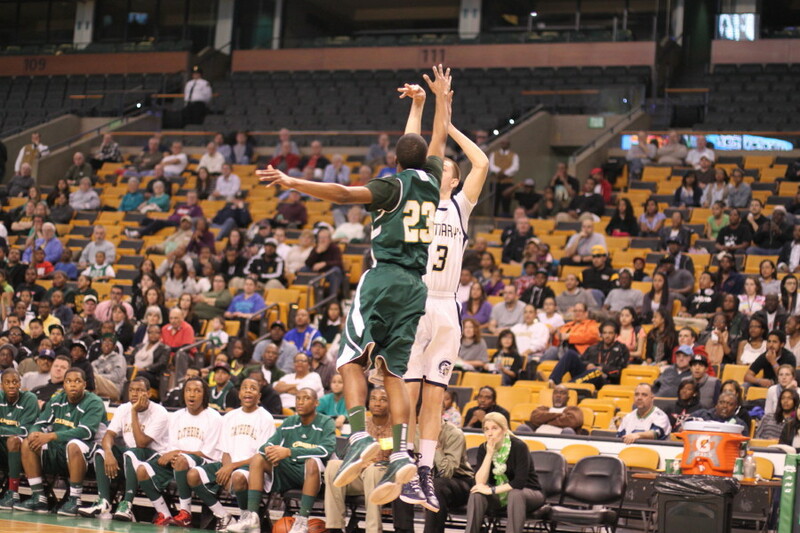 Cathedral applied plenty of pressure but the turnovers resulting were few.